Back cover blurb: It is 1837 and the city streets teem with life, atmosphere and the stench of London. Sarah Gale, a seamstress and mother, has been sentenced to hang for her role in the murder of Hannah Brown on the eve of her wedding. Edmund Fleetwood, an idealistic lawyer, is appointed to investigate Sarah’s petition for mercy and consider whether justice has been done. Struggling with his own demons, he is determined to seek out the truth, yet Sarah refuses to help him. Edmund knows she’s hiding something, but needs to discover just why she’s maintaining her silence. For how can it be that someone with a child would go willingly to their own death? London. 1837. Hannah Brown has been brutally murdered, her ex fiancée James Greenacre and his lover, Sarah Gale, are the prime suspects. James Greenacre has confessed, but Sarah Gale has maintained a stubborn silence throughout her trial before deciding to raise a petition, appealing her prison (and ultimately her death) sentence. Despite her obvious connection with James, Sarah claims to know nothing about Hannah’s murder, perhaps explaining her previous silence during the case. Local lawyer, Edmund Fleetwood is bought in by the Home Secretary to oversee Sarah Gale's appeal. He is reluctant to accept the case when he discovers that his Father "recommended" him, but he cannot deny his curiosity to the case that he has followed since its first day. Edmund realises quickly that there is more to Sarah Gale than meets the eye. After all she has remained silent throughout the gruesome details of the trial neither proclaiming guilt nor protesting her innocence. Edmund is certain that she is hiding something, and he is determined to find out what, no matter the trouble it may cause. 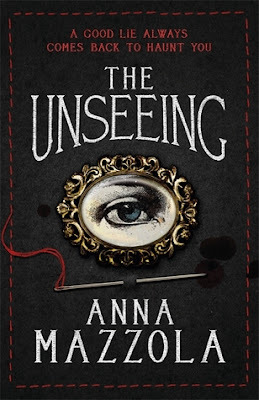 An exciting new voice in historical fiction, Anna Mazzola is definitely an author to watch. The Unseeing is available from 14 July 2016. You can pre-order it now via Amazon online and Tinder Press. Thank You to lovereading.co.uk and Tinder Press who sent me an advanced copy of this novel in exchange for an honest review.